Business as usual despite new housing loan restrictions! According to reports, more than 300 units have been sold at Allgreen Properties' 920-unit Riversails, with at least 20 homes sold over the weekend. Prices of the larger units average slightly over $800psf while the one-bedroom units average $1,000psf. The larger units (three-bedrooms and above) at the 99-year project have been doing well, with quite a few sold to upgraders. Three out of the five stacks of one-bedroom units launched have been sold. Over at Sky Miltonia, 67% of units at this 420-unit have found buyers. The developer is offering an 18% discount and throwing in the option for buyers of certain units to upgrade their flooring to marble. The 748-unit eCO in Bedok South has thrown in an additional 2% furniture voucher in addition to an array of discounts offered. According to our central bank, the average tenure for new residental property loans jumped from 25 years to 29 over the last three years. Over 45% of the new home loans have tenures exceeding 30 years. Lower initial monthly repayments from long loan tenures and low interest rates may cause borrowers to overestimate their loan servicing ability, says MAS (The Monestary Authority of Singapore). Our blog posting on the new housing loan restrictions have generated a fair amount of discussion between our readers (which the wife and I are extremely pleased, as it is another small indication that people actually read our blog). A few have expressed the opinion that the new restrictions will have little to no impact on demand. But if it is indeed true that over 45% of the current new home loans are more than 30 years, we believe that the "penalty" imposed on loan tenures that exceed 30 years will have a significant effect on demand going forward. Already units at new launches are not flying off the shelves as they used to be just a couple of months ago. While we cannot claim to be a representative sample, the new restrictions have effectively put us out of the market for a second property - the longest tenure that the wife and I can qualify for a new housing loan is about 20 years, else we be hit with the new LTV ratio of 40% of the property value should we decide to extend the loan period beyond the retirement age of 65 years. And we are pretty sure that we are not alone in this predicament. 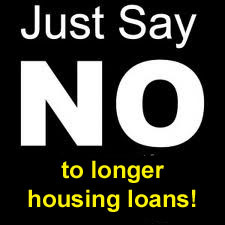 13 comments to ''Business as usual despite new housing loan restrictions!" Hi, if I'm 36 years old and I intend to get 80% loan, it means I can only loan up to 29 years. Is this right with the new cooling measure? Would you advise for me to save up the other 20% before I buy a property for home stay? this will be my first property with no outstanding loan at the moment. Save up the other 20% meaning, I made a downpayment of 40% instead of 20%. 20% more is quite a long time to save up..
banker says mkt all very quiet @11/10/2012. And with regard to the options you presented, it all depend on whether you are comfortable with the monthly repayment for a 29-year loan. The actual monthly repayment quantum may be higher but the total interest quantum payable will be lower. It may not matter too much now given the low interest rate environment but it will become a concern once interest rate starts to climb. The wife and I will always take the shorter loan tenure if we can afford the (higher) monthly repayment. Take maximum long loan tenure (with no intention to use this tenure). Make capital repayments as and when. must wait until 2014 ? Buy what you can (truly) afford, is always the best advice. Are you sure you need the minister or anyone tells you what is yr own true affordability?! A position owned by a personal property proprietor is recommended by many because qualities like this is usually well-maintained, secure, secure and equipped with state-of-the-art features that makes a tenants remain comfortable and practical. It is essential to be cautious when choosing for an area that's up for rental. One must not get confused from the many fantastic kinds of resorts promoted on the web. The right way to do when looking for a position to rental is to think of your needs or that for yourself members, so you can get an area that would best serve your How do I manage my rental property.